I’ve used Switchboard. You’ve used Switchboard. At some point we’ve all used Switchboard. Well us souls lucky enough to find ourselves of the lesbian, gay, transgendered or bisexual persuasion anyway. Today, like many services we rely on Switchboard need us to make a fuss and raise £20,000 before April 2012 if they are to continue supply our city with counselling and information services. A quid each – if 20,000 of us do it. If like me you’ve ever accessed the NHS mental health services you’ll know that if you take the trouble to come out you’ll often be greeted with information that we lucky queer souls can access the counselling services of Switchboard and MindOut! However these services, so often leant on by the NHS to provide the care and support LGBT mental health patients need, are struggling. If one in 4 of us suffers from mental health issues at some point in our lives isn’t time that the proportion of funding for mental health issues reflects those numbers? Sadly I feel it never will and we will continue to rely on services from Switchboard and others to fill the gap making these organisations we simply can’t afford to lose. What are you gonna to do to ensure we don’t? 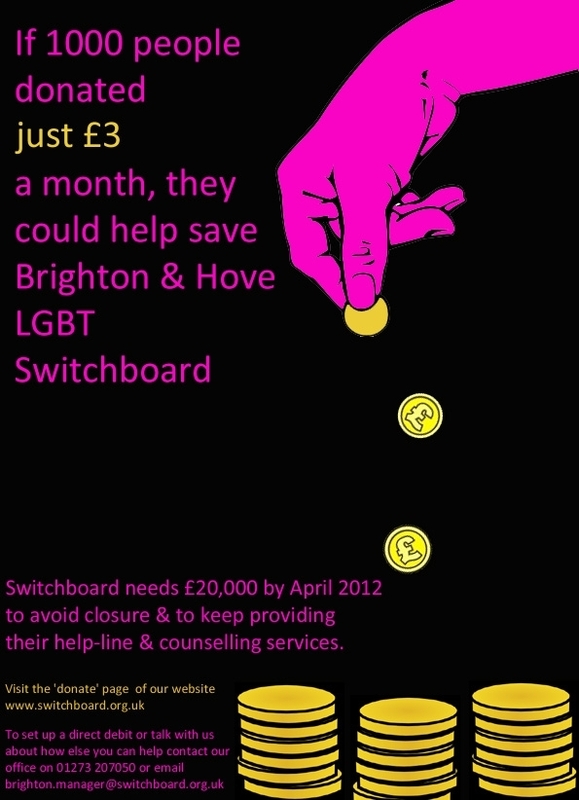 Brighton & Hove LGBT Switchboard provides a telephone help-line service and a counselling service to more than 1000 people per year. It costs the charity £250 per day to operate and Switchboard currently needs to raise £20,000 between now and April 2012 to avoid closure and continue helping vulnerable LGBT people who need these services. Switchboard is doing all it can to cut costs and has already reduced the manager post to half time and increased its counselling fees for people who can afford to pay more. The charity is also working hard at submitting funding applications and hopes to secure funding within the next 6 months to secure its future for next year. However Switchboard needs your help now to help stay afloat until larger funding sources are secured. We all use Switchboard. We all need to step up.